Palo Alto, Calif. • Utah guard Sedrick Barefield’s shot hit the rim and the ball kicked high into the air before settling into the basket, breaking a tie late in Thursday night’s game vs. Stanford. More agonizing moments remained in the last two minutes, but that favorable bounce accurately forecasted a different outcome for the Utes at Maples Pavilion, just this once. After all of the times when the Utes seemingly invented ways to lose basketball games in this building, they somehow won this one: Utah 70, Stanford 66. The Cardinal cooperated, certainly. Yet delivering coach Larry Krystkowiak’s first victory at Stanford in the program’s Pac-12 era after five losses is a genuine distinction for this Utah team. “Being able to say that we did that is a really cool thing,” Barefield said. The unsolved element is how they managed to do it, after nothing went right for most of the second half. 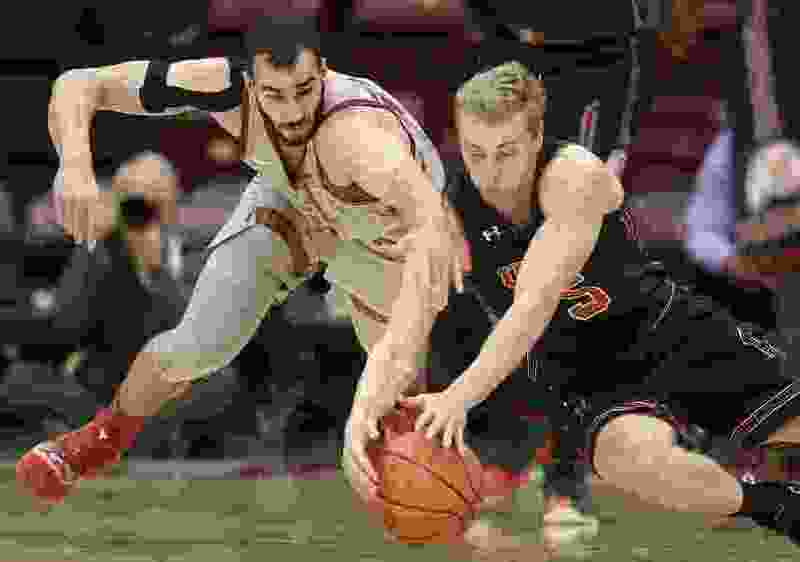 The Utes (10-8, 4-2 Pac-12) seemingly were doomed to another frustrating defeat at Stanford, unable to generate much offense against the Cardinal’s trapping and shot-blocking defenders, while lacking any rim protection of their own. Forward KZ Okpala scored 22 points for Stanford (9-10, 2-5), and the Cardinal surged ahead after trailing 31-26 at halftime. In the end, it all worked out for Utah. “A big word in our program is 'believing,' ” Krystkowiak said, and the Utes persevered their way to a rewarding victory. As this game unfolded, it became clear that the losers would walk away wondering how they ever could have lost to that opponent. To their credit, the Utes were not the ones asking that question. Barefield fulfilled Krystkowiak's halftime request to “get me a win” at Stanford, thanks partly to a designed play named after a little-used former Utah player. Xan Ricketts, this one's for you: Jayce Johnson's screening helped free Barefield during his run of three 3-pointers, starting when the Utes were down by four points in the last six minutes. The outlook was even more bleak just before that sequence, when Stanford had a six-point lead with two chances to increase it. But to illustrate how Utah got contributions from a bunch of people, reserve guard Charles Jones Jr. drove for a layup. Barefield then got hot, Parker Van Dyke made a go-ahead layup and Jayce Johnson (11 rebounds) anchored a defense that did just enough in the last minute to maintain the lead. If the Utes had lost, the diagnosis would have been easy. Stanford's aggressive defense took the Utes out of their offense, and when Utah succeeded in getting to the rim, the Cardinal blocked 10 shots. Utah thrives with 3-pointers, and Stanford was determined to take those away. Only in transition, and during Barefield's clutch stretch, were the Utes able to launch many 3-pointers. They made nine of those shots (in 14 attempts), and needed every one of them. A late 8-0 run helped @UtahMBB seal the win. Barefield was held to five points in the game's first 34 minutes, but he finished with 18. Utah ended up with a respectable box score on a night when Krystkowiak labeled his offense “atrocious,” as Donnie Tillman scored 11 points, Van Dyke added 10 and Both Gach and Johnson had nine each – even though Johnson missed three free throws in the last minute. The strange part was how the Utes went 16 of 39 on 2-point attempts and managed to win. Barefield actually may have overpassed at times Thursday, but he stepped up and hit big shots when the Utes needed them. The outcome showed “our resilience and toughness and our willingness to defend,” Barefield said. Those traits, characterizing some of Krystkowiak’s past teams, were missing in November and December. The Utes discovered them Thursday, when they did something that none of his teams had ever done. That creates another fresh opportunity, a potential Bay Area sweep with Saturday’s game at California to come.